It was inevitable: Once Amazon started talking about doing deliveries by drone, other industries were sure to follow. Perhaps it's no surprise that Hollywood is next in line, hoping to use drones to easily capture footage that would otherwise require a helicopter. 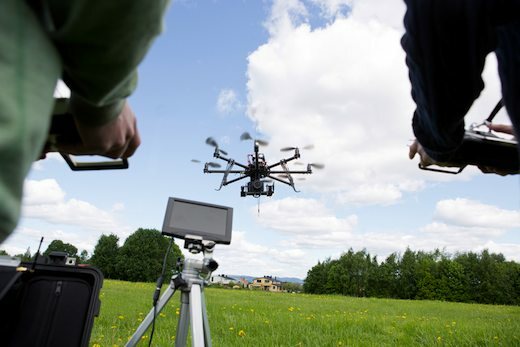 Filmmakers have petitioned the FAA to allow them to be exempted from regulations on unmanned aerial vehicles which the FFA hasn't actually written yet, meaning any kind of drone flight—commercial or noncommercial—is essentially banned. The MPAA, filing the petition for filmmakers, has requested exemptions from regulations that address general flight rules, pilot certificate requirements, manuals, maintenance and equipment mandates. The FAA can grant these exemptions, but first the MPAA must prove that their drone use would be safe and that allowing them to fly drones would be in the public interest—but even with the exemption, the FAA would still need to approve moviemaker's individual drone operations. While it's only a matter of time before commercial drone use becomes commonplace, to date the FAA has only approved one drone operation, which makes things seem iffy for both Amazon and Hollywood. Congress has asked the FAA to come up with a plan for "safe integration" of drones by September 15th, 2015, but that's still a long way off for businesses eager to get in on this new technology. Drones are just in their infancy. This technology will be talk of a whole generation.